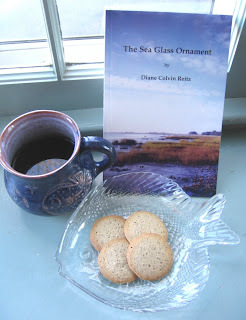 I was fortunate enough to have Diane Colvin Reitz, Author of The Sea Glass Ornament, to contact me in early January of this year. Diane offered to send me a copy of her recently published book for review. Due to my love for sea glass and the coast.... of course I said yes! Not only is a sea glass ornament a focal point in her story - but it takes place on the coast of Georgia with memories of Round Pond, Maine scattered throughout. The story is about love, loss and finding beauty and love where you least expect it. Below I have included bits and pieces of my conversation with Diane over the past couple of months. SGT: I wanted to let you know that both my mother and I have read your book. We LOVED it!!! I was so sad to reach the final page as the story of Ollie and Hike's journey left me wanting more. It was so beautifully written and the words easily painted pictures in my mind as if I were living Ollie's life through her eyes. I was wondering if Cora was related to you and/or a real person from your life... as I noticed you both have the same name of Colvin - or if that was just the name you decided to give the character. It was such a bittersweet story.... to remind us that we are never alone in this life... in the afterlife... and love is never out of reach. DCR: Cora Code Colvin was my grandmother. The sea glass image for me is very important in the story because sea glass is formed from the constant churning and upheaval of the sea - and this process, produces great beauty. Yes, I wish the book was longer too, but it kinda finished itself. SGT: I loved the fact that the story left you wanting more... superb! So... the question I have wanted to ask... was this book based on a true story? DCR: The book is fiction. However, Cora Code Colvin is my grandmother's real name and Round Pond, Maine is my favorite real place in the whole world. I have found great sea glass when the tide goes way out along the coastline. I am really a poet and this book was my first published prose. The story is to convey the beauty of humanity - and that is truly real. I have enjoyed this opportunity to get to know this amazing author and read this truly beautiful book. Pick it up... grab a cup of coffee and totally immerse yourself in the characters... it won't take long and you won't want to put it down until you finish! 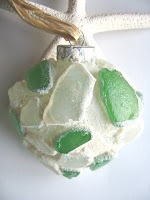 The Sea Glass Ornament can be found at Goose River Press (scroll to the bottom of the main page) and Amazon.com.